Arrow points at the soybean formation through early morning mist. 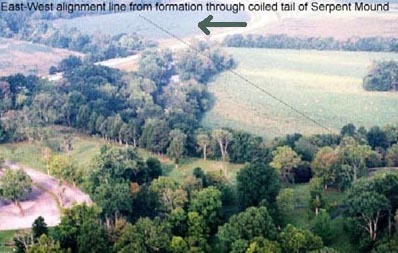 Thin black line extends from the formation to lower right beige clearing which is the tail of the Serpent Mound. Aerial photograph © 2003 by Jeffrey Wilson and Roger Sugden. Serpent Mound soybean formation first discovered August 24, 2003, was 271 feet from top of large ring to bottom of small, ringed circle, all oriented east to west. The diameter of the “Eye” in the Vesica Piscis was 74 feet. 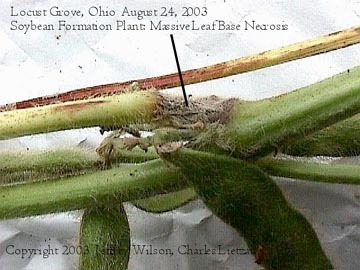 May 9, 2005 Batvia, Ohio – Two years ago, between August and November 2003, four crop formations in soybeans were reported in the mysterious and ancient mound-builder’s region of southern Ohio. 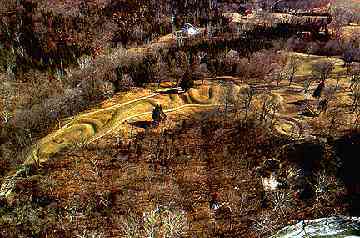 Most important in terms of plant and soil anomalies was the first one discovered on the morning of August 24, 2003, not far from the famous Serpent Mound near Locust Grove, Ohio. 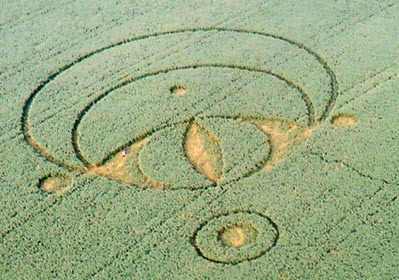 The tall soybean plants had been laid down in a geometry based around the Vesica Pisces symbol found so often in British crop formations. Its longest length was 271 feet and there were no tracks around the entire perimeter or inside the extraordinary pattern. Jeff Wilson, Director of the Independent Crop Circle Researchers Association based in Cincinnati, Ohio, said that soybean crop formations are very rare in the United States and of the 100 American crop formations he had personally investigated by August 2003,“the Serpent Mound pattern is one of the most sophisticated geometries that we’ve seen.” All the electronic testing Jeff and his colleagues did and studies of plant samples have shown statistically significant anomalies. What none of us knew in 2003 was there were at least three eyewitnesses the night before (August 23, 2003) at 9 p.m. who watched mysterious lights move for several minutes right over the land near the Serpent Mound. For the first time on the record, Tree Pruitt of Batavia, Ohio, explained what she and her husband and brother-in-law saw during a birthday celebration at her sister’s home only about 20 minutes by car from the Serpent Mound. Tree Pruitt, Freelance Artist, Batavia, Ohio: “The lights were yellow around the outside, blue-white, and then the very center had a tiny white core, a very bright white core. They were far too high in the sky to have been headlights from a car. We were on top of the hill, so it was unlikely we were seeing a car coming toward us on the road. In addition to that, the lights were moving in circular patterns and we both agreed that it reminded us of writing in the air with a sparkler on the 4th of July. The lights left traces behind as they moved and they moved back and forth as if you were slowly dangling them from a string, almost a swaying motion. Sometimes they would move back and forth and then one would move in a circular formation and they would dance around each other. We believe there might have been up to eight individual lights. We are not positive there were that many, but there were definitely at least three to five. The spheres of light were about the size of a basketball from our frame of reference. SO THESE LIGHTS APPEARED TO BE RELATIVELY LARGE AND COULD YOU GO OVER THE DETAILS OF THE COLOR AGAIN AND THAT SPARKLER LOOK? The size of the lights being about a 20-minute drive away from us, from where we were standing looking at them, they were about the size of a basketball from our frame of reference. So wherever they actually were, we figured they would have to be pretty large to be that easily visible. As far as the coloration, you could distinctly see ­ it was almost as if there were three circles overlapping each other, one within the other, evenly. The very center core was very vibrant, clear white. Then there was a rim around that of an almost electric blue, as if the way light shines blue. Then the final rim was yellow, the yellow of a light as if when you are using a cheap light bulb and it casts a yellow glow to the room. So, it was almost amberish in tone. Some would move back and forth and others would move in circular patterns and they wove around each other. It was almost like watching a dance. It was very graceful movements. Then on a few occasions, there were sharp right angular movements. But the majority of the movements were very graceful, very flowing, back and forth and around movements. HOW LONG DO YOU THINK YOU WATCHED? Judging how long it took us to smoke cigarettes, unfortunately, it might have gone on anywhere between 5 to 12 minutes. We called the rest of the family to come outside and take a look. I asked my brother-in-law if he ever recalled seeing anything like that before. He is a total skeptic when it comes to lights, aliens, anything like that. But they do sit outside often at night and watch the stars. He said he had never seen anything like that before. It came to an end while everyone else in the house was coming out to take a look at it. The lights just seemed to move away and disappear. 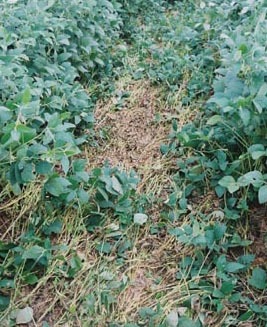 In the downed soybeans of that unusual 2003 Serpent Mound crop formation, researchers found a layer of heat damage at the base of the leaf stems. The implication was that some kind of energy interacted with the soybean plants and heated up those cells. Normal soybean leaf base sampled as a control for comparison to plants gathered from inside the Serpent Mound formation. Photograph © 2003 by Jeffrey Wilson and Charles Lietzau. Soybean leaf based sampled from within the Serpent Mound formation which shows deterioration, possibly caused by heating. Photograph © 2003 by Jeffrey Wilson and Charles Lietzau. 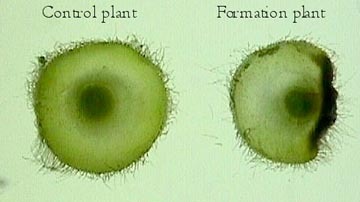 Cross section of soybean leaf bases: on left is normal plant. On right, is a plant sampled from within the formation which shows deterioration, possibly caused by heating. Photograph © 2003 by Jeffrey Wilson and Charles Lietzau. What typically happens in the field crops is that the vessels that carry the moisture through the plants ­ those heat up and it creates a pressure that explodes out of the growth nodes of the plants. But in this case, the layer of parenchyma cells is much thicker in soybeans and acts as a kind of cushion and doesn’t actually reach the vessels that would carry that moisture. So, it’s only that layer of damage that we see in these plants, again suggesting heating. 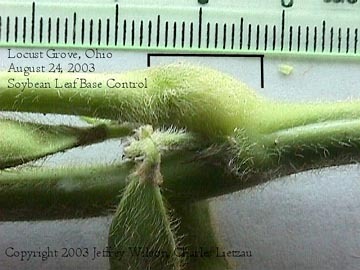 Brown, damaged areas were mixed among the still-growing soybean plants laid down clockwise in the large outer ring of the formation. Photograph © 2003 by Jeffrey Wilson. Biophysicist W. C. Levengood at his Pinelandia Biophysical Laboratory in Grass Lake, Michigan, has done extensive research on crop formation plants and soils since the early 1990s. He has published some of his discoveries in the prestigious botany journal, Physiologia Plantarum. He hypothesized that many of the crop formations he has studied were produced by plant interaction with a “spinning plasma vortex.” That vortex of stripped positively and negatively charged ions also contains microwave energies. Levengood theorizes that the spinning energy system originates high in the atmosphere from an unknown source before the vortex descends toward specific places on the Earth’s surface and leaves behind the baffling and beautiful crop formations now reported in dozens of countries around the world since the early 1990s. Previous PostPrevious Did Milky Way Gas and Dust Turn Earth Into Icy Snowball Four Times?